Established technology from the ID21 high-end lifting columns: The DD21 S are equipped with OKIN’s patented sliding system, which ensures exceptional comfort during all desk height adjustments. The stronger profiles on these lifting columns feature improved stability so that they comply with the requirements of the FB147 pendulum impact test. The DD21 S provides an ideal drive solution for stable desks that do not have a crossbeam in the footwell – and thus more legroom. 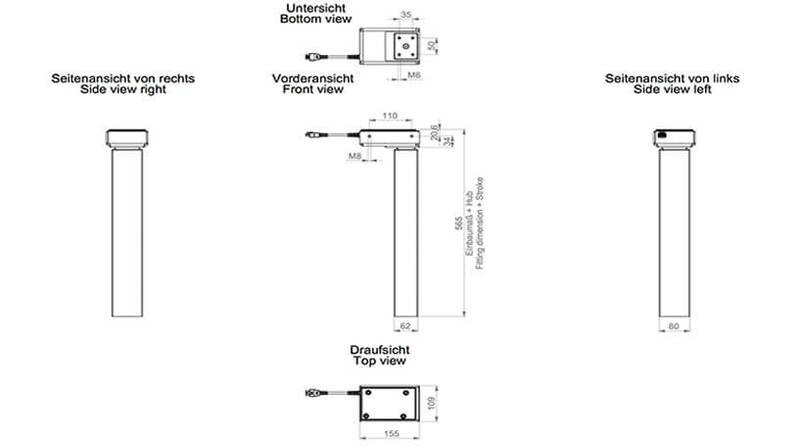 The elegant profile, already in use for the high-end ID21 lifting columns, provides another distinguishing feature that has impressed customers. The modern design of the DD21 S has no visible function openings and only a minimal difference between the individual profiles. This provides furniture manufacturers with more liberty during the design of their desks. OKIN is also using its high-end technology for the DD21 S. Powerful, maintenance-free 24-volt DC motors with two Hall sensors are used; these generate a compressive force of up to 700 Newton. Their special gear ensures users get whisper-quiet operations at all times. The DD21 S has a very low installation dimension of only 565 mm and a standard-compliant stroke length of 650 mm. Thus, these lifting columns provide an exceptional level of practical versatility for adjusting tables. The DD21 S can also be configured with optional accessories such as different table legs, frames and handsets. They are compatible with OKIN’s well-established SmartEco and COMPACTeco(+) control units, which can be programmed according to user requirements. They also feature ISP intelligent system protection. * Depending on the drive configuration, at const. 24/29 VDC with no load."